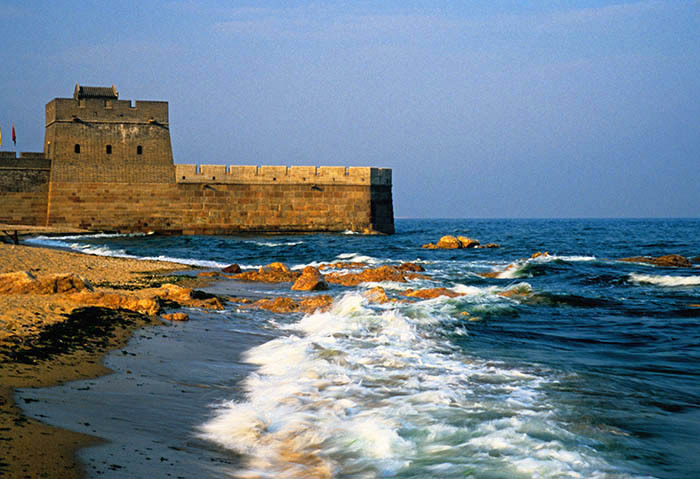 The Great Wall begins on China’s east coast where it meets the Bohai Sea at Old Dragon’s Head (Laolongtou), named in typical Chinese fashion because it looks like a long dragon drinking water from the sea. This section of the wall was built during the Ming dynasty in 1579, but the present construction only dates from the late 1980s when the original was replicated. Because of its seaside location, Laolongtou is highly popular with mostly Chinese tourists. 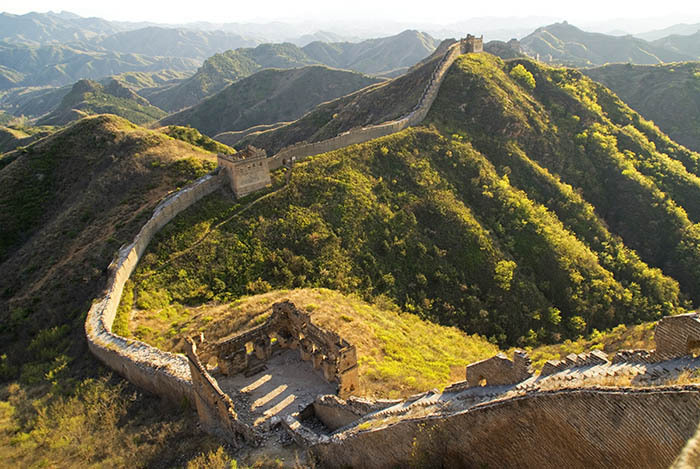 Much of the original Great Wall was built with a variety of materials including stones, bricks, and a glutinous rice soup mixed with reeds, sand, lime, and earth. 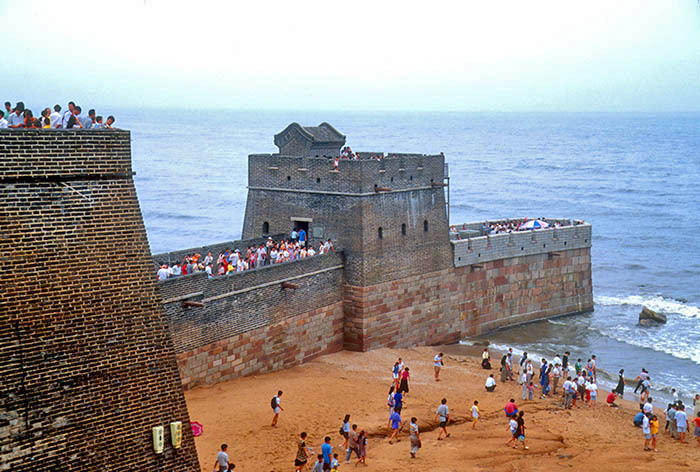 However, because Laolongtou had to withstand heavy battering by waves from the sea, the construction here was unique. It consisted of massive blocks of granite cut with troughs that were filled with molten iron to bond them together. 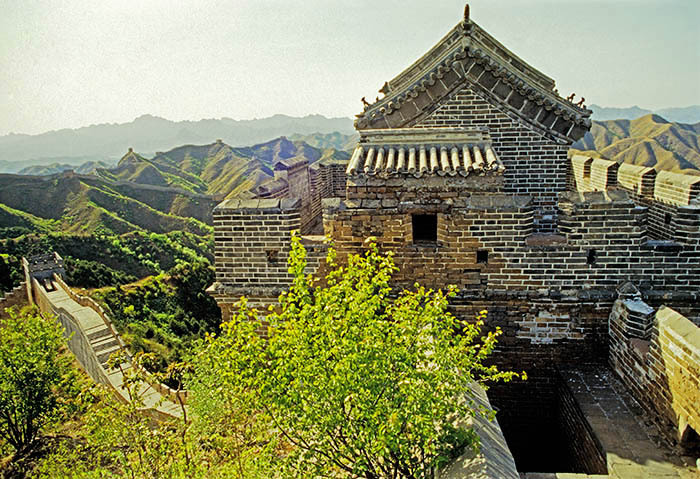 The First Pass Under Heaven of the Great Wall is the east tower of Shanhaiguan (Pass Between Mountains and Sea). 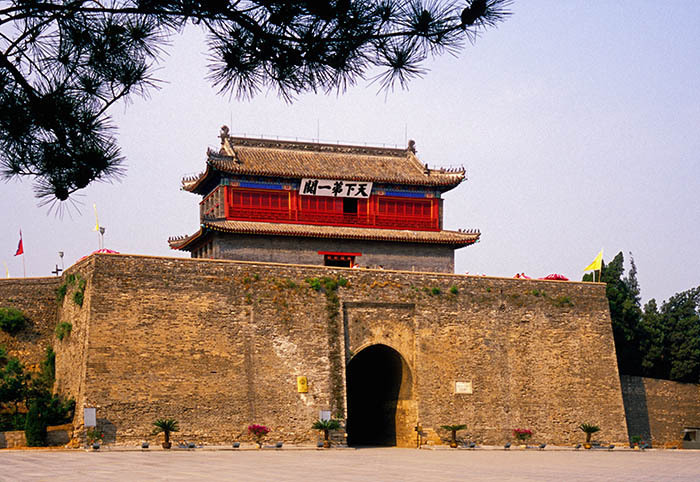 This easternmost gate guards the strategic route from the north to the northeast of China. From the top of the 45-foot high tower, the sea can be seen to the east with the Great Wall snaking to the west. A map located in the Great Wall Museum at Laolongtou illustrates the layout of the Shanhaiguan Chinese border town. 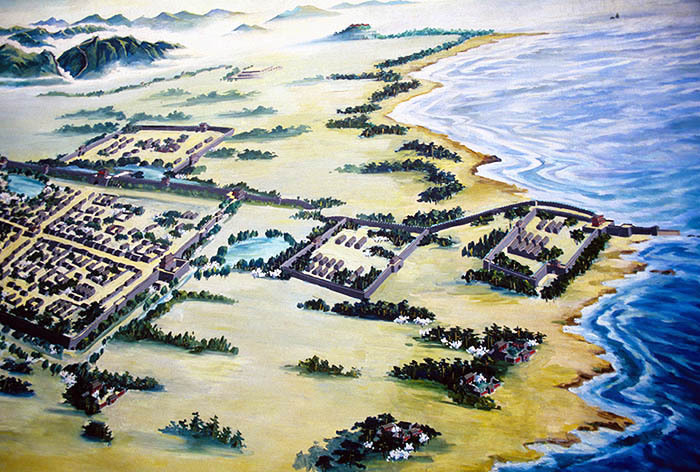 The seven parts of the wall complex were Estuary Stone City, Nereus Temple, Jinglu Beacon Tower, Nanhaikou Pass, Ninghai City, Binghai Walls, and its most celebrated structure, Chenghai Tower. On a day in 1644 Wu Sangui, a general in the Ming army, opened the gates at this site to allow the Manchu army to march through on the way to attack Beijing and overthrow the corrupt and dysfunctional Ming dynasty. Situated on a steep and abrupt mountain ridge in the far north of Tianjin municipality, Huangyaguan (Yellow Cliff Pass) is at a small section of the wall originally built over 1400 years ago in the Northern Qi Dynasty and reinforced with brick walls during the Ming Dynasty. Following a 1984 reconstruction of 3 kilometers of the wall that included 20 water towers and a water pass as seen at the bottom of this photo, it became a major tourist attraction, including as the site for the Yin Yang Music Festival featuring Chinese and international electronic dance music groups annually. At Huangyaguan the Great Wall narrows to a single wall on the steepest ridges leaping between cliffs and crags. In some sections the precipitous wall appears to run straight up and down. Considering the lack of advanced engineering technology and means of transport, construction was extremely difficult, relying on an enormous quantity of manpower that was comprised of soldiers, common workers, and criminals. 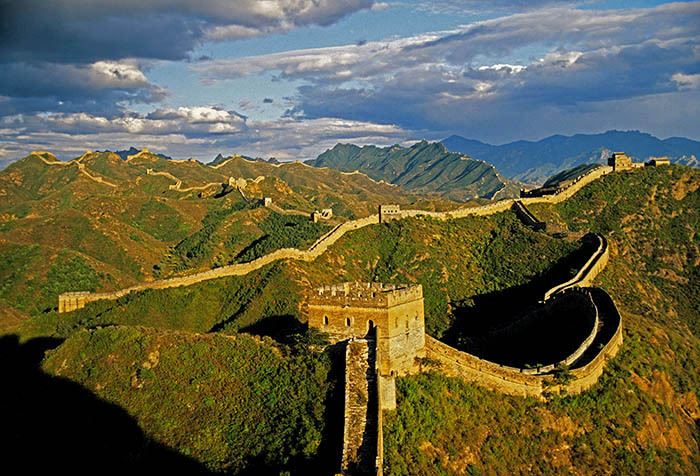 During the Han and Qin dynasties every able-bodied man was required to spend at least a year building or guarding the wall. 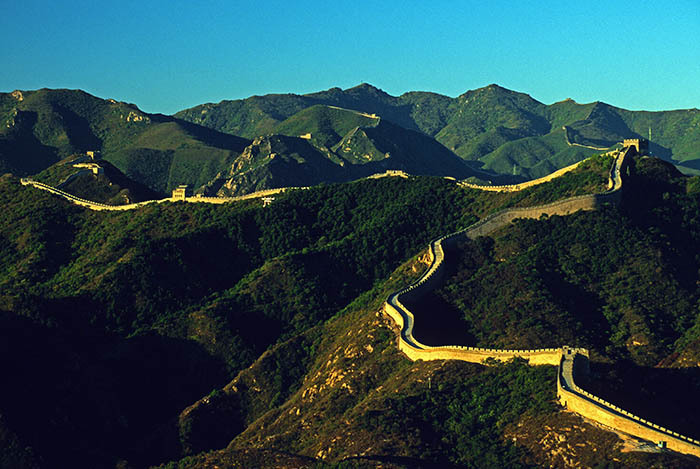 Relatively isolated and offering a great overview, the Jinshanling section of the Great Wall is one of the best preserved parts of the wall. 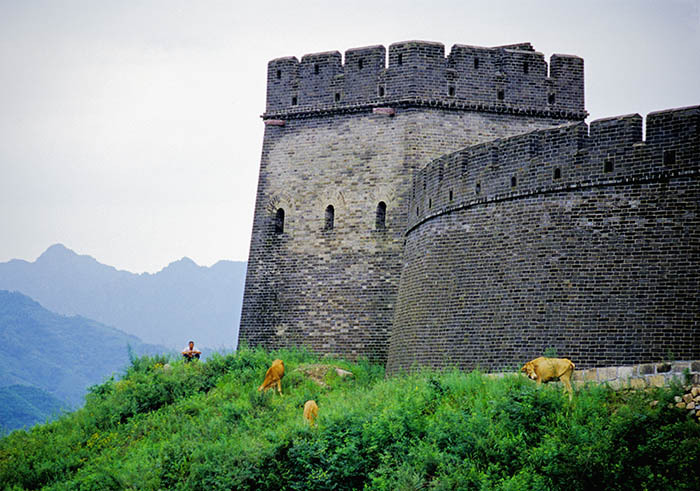 Named Jinshanling because it was built on the Greater and Lesser Jin Shan (Gold Mountain) Ranges, it displays many original features of wall construction and the towers here are all two storeys with lower levels storing weapons and supplies. It also has one double wall that leads upward to an outstandingly large tower that might be, according to historical records, the main command post for defending the nearby capital of Beijing. An original construction feature at Jianshanling is believed to be the “Commanding Tower, a large watchtower which has two tiers connected by stone stairs. It is uniquely equipped with a barrier system of double walls. The top tier includes a barracks consisting of a small room used as sleeping quarters for soldiers commanding the tower. The rafters and eaves of the room are unique as they are all made from polished bricks. The wall at Jinshanling falls away steeply from General’s Tower. With five passes, 67 towers, and two beacon towers for signaling, the wall here stretches 10.5 kilometers and is in various stages of repair. However, the condition of the wall deteriorates toward its natural state as it approaches Simitai. 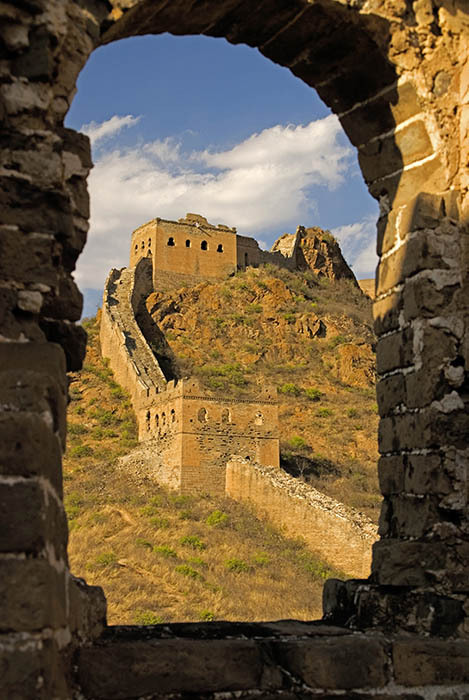 Looking out from a watchtower at Jinshanling, the defensive towers of the Ming Great Wall can be viewed nearby. The towers functioned as “beacon pavilions” during the Qin and Han dynasties and as “smoke mounds” during the Ming. With smoke during daylight and with fire at night, information about impending attacks could be signaled to command posts and then relayed all the way to the capital. A high panoramic overview of the Great Wall at Badaling gives an idea of the vast sprawl of the wall as it meanders through valleys and over mountains. With up to 72,000 visitors per day, this section north of Beijing is the most visited. It cannot be understated how much the wall has affected the course of Chinese history by facilitating economic, cultural, and racial assimilation between the North and the South as well as integrating the far sparsely populated West with the densely populated East. 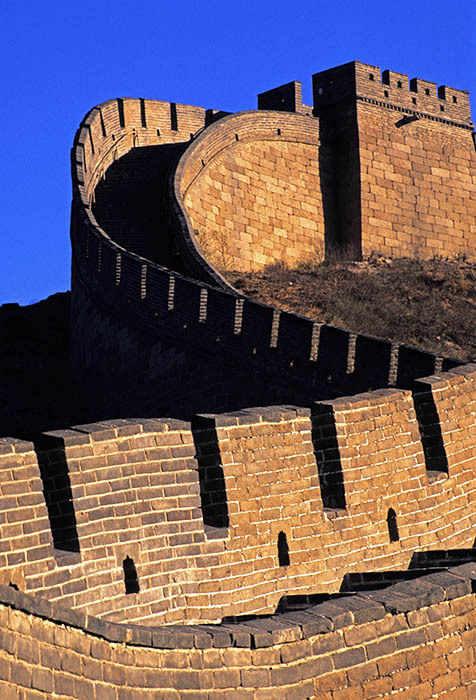 The Ming Great Wall consisted of a multi-layer system of defense. The valley near Mount Badaling in Beijing Municipality accommodated four fortresses resulting in a formidable defense system for the capital. 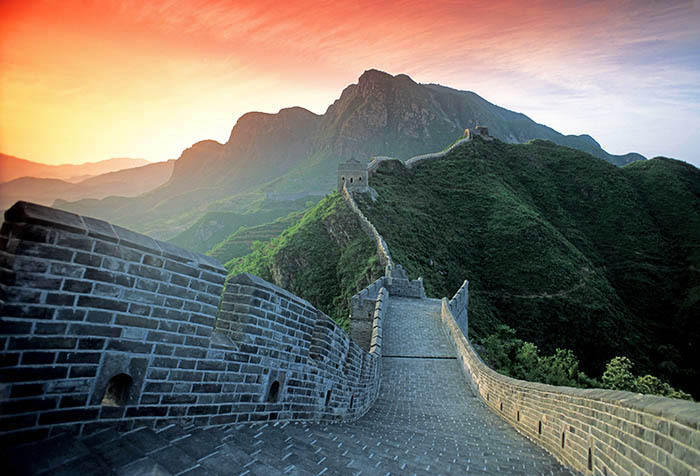 The history of the building and renovation of the Ming wall spanned nearly two hundred and seventy years with an advanced technology of construction that surpassed all previous dynasties. 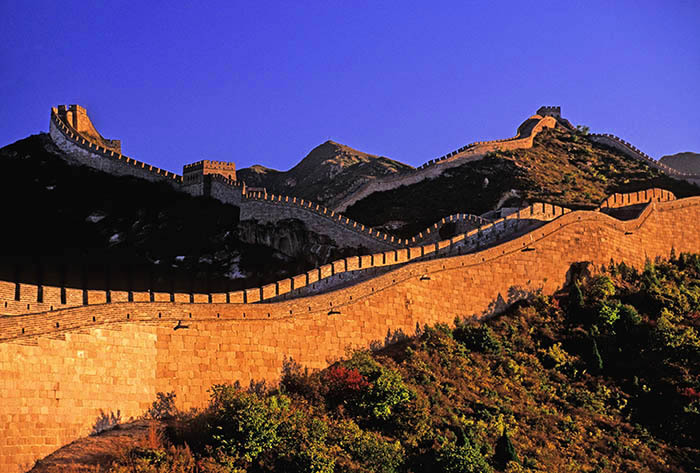 The Badaling Wall is a typical section of the Great Wall. Its foundation is built of stone slabs supporting bricks of uniform size. Standing approximately 25 feet high, the top is 16 feet wide, broad enough to accommodate five horses and ten soldiers marching abreast. 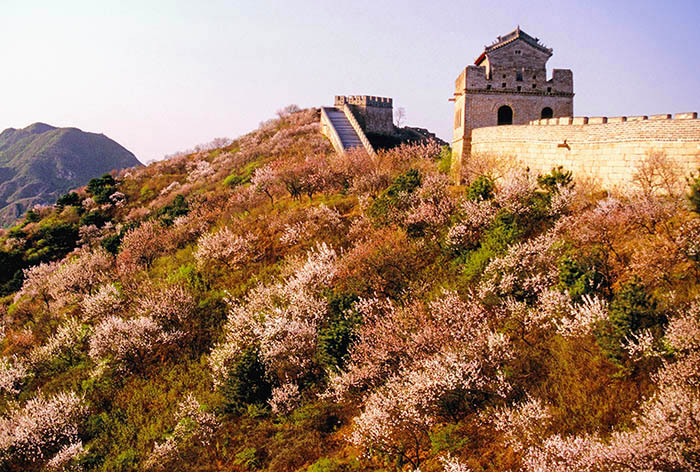 Watchtowers on the Badaling Wall are set at intervals of 200 to 230 feet. 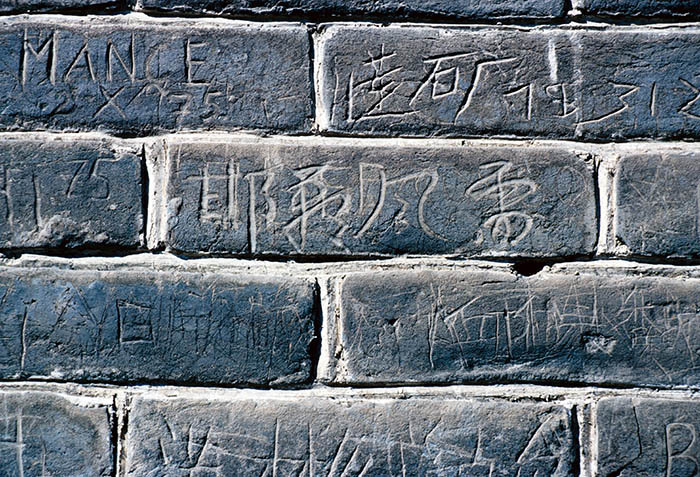 Tourists have been leaving their mark on the Great Wall for several years with Chinese officials proclaiming that the ancient monument is “under attack.” In an attempt to constrain this desecration, a “dedicated graffiti zone” has been established inside tower #14 at Badaling. Lined with white surfaces conducive to magic markers and protective of the wall’s ancient bricks, graffiti artists can now immortalize themselves without damaging precious artifacts. If the experiment proves successful, additional towers will be opened as graffiti zones. The Great Wall that remains at Badaling Pass is but a remnant of a formidable complex system of fortifications and barriers. 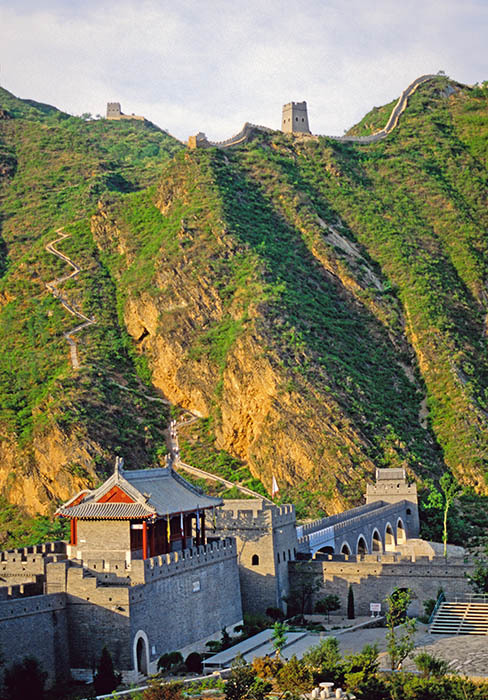 During the Ming dynasty a series of defenses were built here that included two forts and a major fortress, as well two barrier gates and two walls extending up steep slopes to the summits of adjoining peaks. All that remains is the Badaling Wall, familiar to the majority of tourists who visit from around the world. 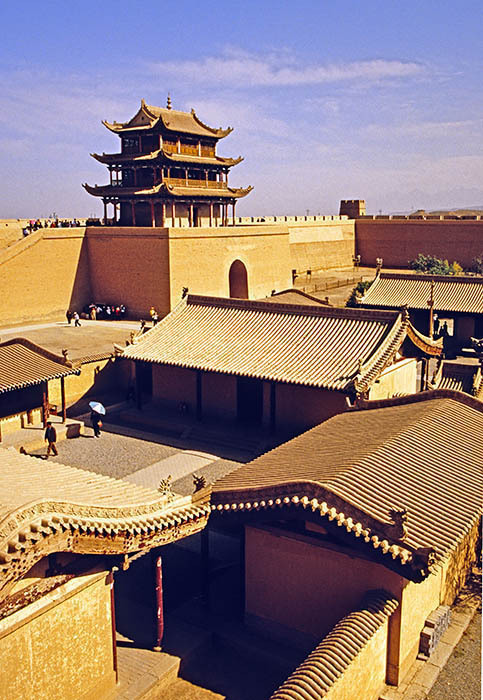 The walls of the fortress at Jiayuguan Pass are about 30 feet high. In addition, ten towers each with different shapes and abundant buttresses were built on the pass. At the time the fortress was built, conditions for the construction workers were very hard. Without lifting equipment, they had to carry all the bricks. Those used to build the pass were fired in a kiln 12 miles away. After firing the bricks, workers used oxcarts to carry them to the pass, and then had to pass them up onto the wall by manpower. The problem of lifting the heavy bricks up the wall was solved by a young local goatherd who volunteered his goats to do the carrying. 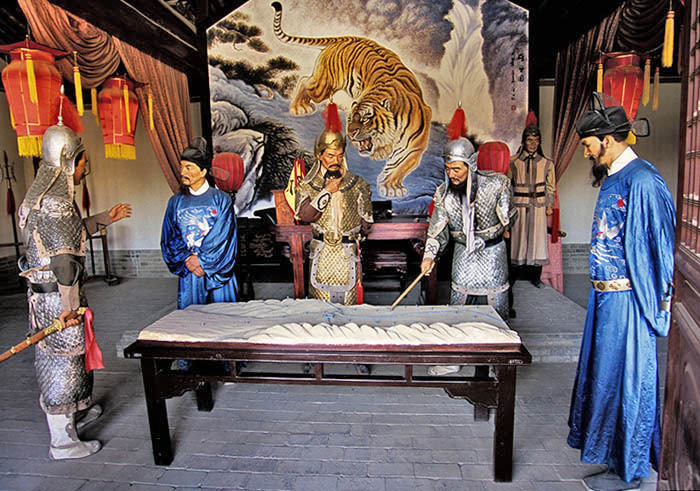 Inside the Jiayuguan fortress is a re-creation of Ming military commanders planning the defense of the fortress at the western terminus of the wall in Gansu province. The fortress town garrisoning imperial troops was under the command of a chief military officer and a deputy chief military officer with subsidiary commanders of different levels of authority. The highest official of each major garrison region, the commander-in-chief, would be a vice-minister of the national Ministry of War as well as the chief civil administrator of the region. 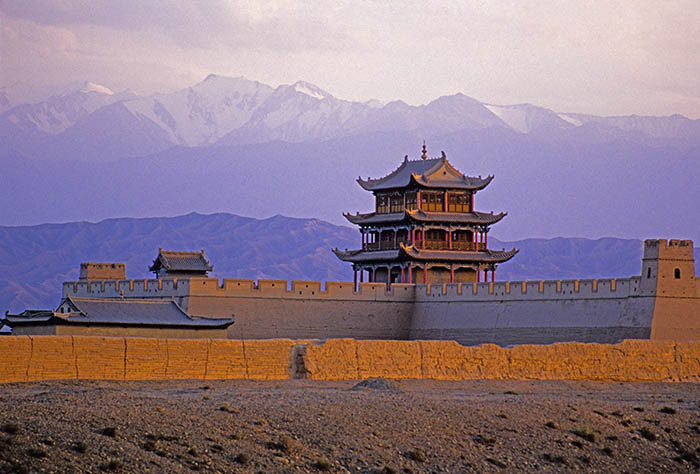 Against a background of the snow-covered peaks of the Qilian Mountains, the last fortress of the Ming Great Wall in the west stands at Jiayuguan Pass. Acclaimed as “The Strongest Fortress under Heaven,” the fortress was built here to take advantage of the area’s environment, which included nine natural springs of fresh water. To the west of the fort the Silk Road traverses vast stretches of Gobi to the outer reaches of the Chinese Empire and beyond.